One of my absolute favorite places in Jerusalem — and not just as a tour guide but also as a city resident — is Machane Yehuda, the outdoor market at the heart of the city. I’m a real foodie, and this market (commonly just referred to as “the shuk” — the Hebrew and Arabic word for market) is a gourmand’s playground. I’ve given many a tour there, and love bringing people to what I consider my second home. And yet, I realized that there is so much more to the shuk than just the delicious food. So much history and complexity. To me, Shuk Machane Yehuda is actually the city of Jerusalem in microcosm. The people who shop and visit there reflect the diverse populace of the city. And the changes that have taken place in the shuk over time mimic the changes that have transformed the city itself. So I decided to create a series of blog posts that will try to tell you everything you ever wanted to know about Machane Yehuda market. I first thought about all the things I wanted to tell you about the shuk, and then I also asked friends if they had any questions they wanted answered. This will be the first of at least five different posts, and will deal with background information — some of the what, why, where and when. So if you have questions of your own, please send them to me so I can try to include answers in future posts! At its core, Machane Yehuda Market is the main place for Jerusalemites to buy groceries: produce galore (and super fresh, to boot), meat and fish, eggs, spices, baked goods and the like. But over the years, it has become so much more. Specialty food shops, restaurants and cafes, bars, houseware stores, and even clothing and jewelry stores. You can find it all in Machane Yehuda. But more than that, the shuk is a place of legends and stories. A place where you can truly absorb the atmosphere that is uniquely Jerusalem. It is a place to shop, but also a place to sit, to talk, to meet, to smell, and to listen. To be accurate, “Machane Yehuda” is not the market itself. Machane Yehuda is a small neighborhood (established in 1887) directly across Jaffa Road from the market. It was named for Yehuda Navon, brother of one of the neighborhood’s founders. Thus, Machane Yehuda Market or Shuk Machane Yehuda is a more accurate way of referring to the shuk, but most Jerusalemites won’t use the full name. The truth is, however, that this was not the original name of the market. Originally it was referred to as Shuk Valero or Shuk Beit Yaakov, the former being the name of the original landowner and the latter being another early neighborhood (est. 1877) adjacent to the market. But in the early 20th Century, once Machane Yehuda grew in popularity as a neighborhood, people changed how the referred to the market. Why is it located where it is? No one ever planned to build a market here at first. It just developed organically at this spot. The first neighborhoods built outside the walls of Jerusalem (in the 1860s and 1870s) hugged the Old City on its western side. But after the first five were established, the next area was a bit further west, along Jaffa Road. As this was the main thoroughfare between Tel Aviv and Jerusalem, it was a logical place to build. And the neighborhoods built here were roughly halfway between the Old City of Jerusalem and a cluster of Arab villages further west. Most people traveling between Tel Aviv and Jerusalem came by stagecoach, and the final stop on the way into Jerusalem was right next to Beit Yaakov. From there, people would travel the final leg into the Old City by local carriage transport. 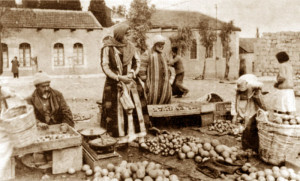 For these reasons, Arab fellahin (peasants) from the villages to the west (Deir Yassin, Lifta and Sheikh Bader) began to bring their produce here and sell it in the open field owned by the (Sephardic Jewish) Valero family. Since many people would get off at the stagecoach station (located where the Discount Bank is today, on the corner of Jaffa and Beit Yaakov roads), and also because the residents of the local neighborhoods didn’t want to travel the long distance into the Old City just to shop, the market began to flourish. In my next post, I will discuss a bit about how the market developed and changed over the years, growing from a bunch of crates in an open field into the complex of small varied shops that we know today. Future posts will also discuss where you can find various things, when to visit (and what you can expect to see at different times), ownership issues, etc. Please feel free to leave a comment below if you have any questions you want answered, or contact me directly! When I go into that area I love to look at the buildings. The architecture is great and varied. It does not look like it is all from the same period, rather a mix of Mandate, Ottoman and modern with many other influences, probably from the multitude of cultures moving into that area. One interesting building is the Zohare Chama building, with the sundial on it, directly opposite the exit to the shuk on Rechov Yaffo. That building was built by my great, great grandfather, Samuel Levi, and has his name on it to today. I would love to hear what you know about all of that, as well as the adjacent neighborhoods, especially Geula and Nachlaot and especially facts that we would not find in Wikipedia. Great job. I look forward to future entries. Thanks so much Daniel. And how cool that your ancestor built such a famous building. While I agree that the surrounding areas are quite interesting (in fact, I sometimes give a full tour through the entire Nachlaot), I think that might be out of the scope of this specific series of posts. 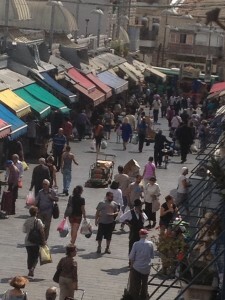 I am really trying to stay focused primarily on the shuk itself. Perhaps in a future post? How about adding a map? As your blog proceeds, we can then follow you by looking at the exact location where it’s pinpointed on the map. Thanks, Yaya! Was definitely thinking about it. Will try to do so! Just a suggestion: Maybe as part of this series, you can compare and contrast it with other markets such as the Shuk HaCarmel in TA to point out what makes Machane Yehuda unique (other than being in Jm).